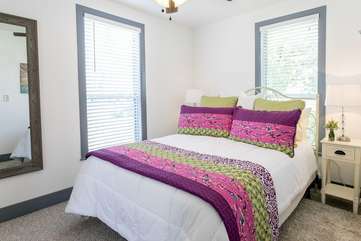 This wonderful cottage is located just a few blocks from Main Street shopping and restaurants. Just one block from Main Street guests will find The Cottage quiet and private. Inside is an open living, kitchen and breakfast bar with four stools. A 45” flat screen Cable TV in the living room is placed to be enjoyed from the comfy sofa and chairs. The kitchen is perfect for cooking in with it’s electric range/oven, large refrigerator, dishwasher, microwave and coffeemakers (regular and Keurig). A larger more private dining room is found behind the kitchen and enjoys it’s own television. Three bedrooms with queen beds are wonderfully decorated with elegant touches. The bathroom is found between the front two bedrooms. The bath is equipped with a handicap accessible shower. The back bedroom will need to enter the bathroom through one of the bedrooms. Enjoying the outdoors will be a highlight during your stay. A hot tub is privately concealed. The patio has a charcoal grill and table for four. There is even a chiminea. As an added plus your dogs can enjoy romping in the fenced area on the back side of the property. Had an amazing visit for my moms 70th bday with her best friend. Beds were so comfortable. All the extra attention to detail from eggs and juice in the fridge to beautiful flowers and fresh banana nut bread we had ordered. Will definitely be coming back.